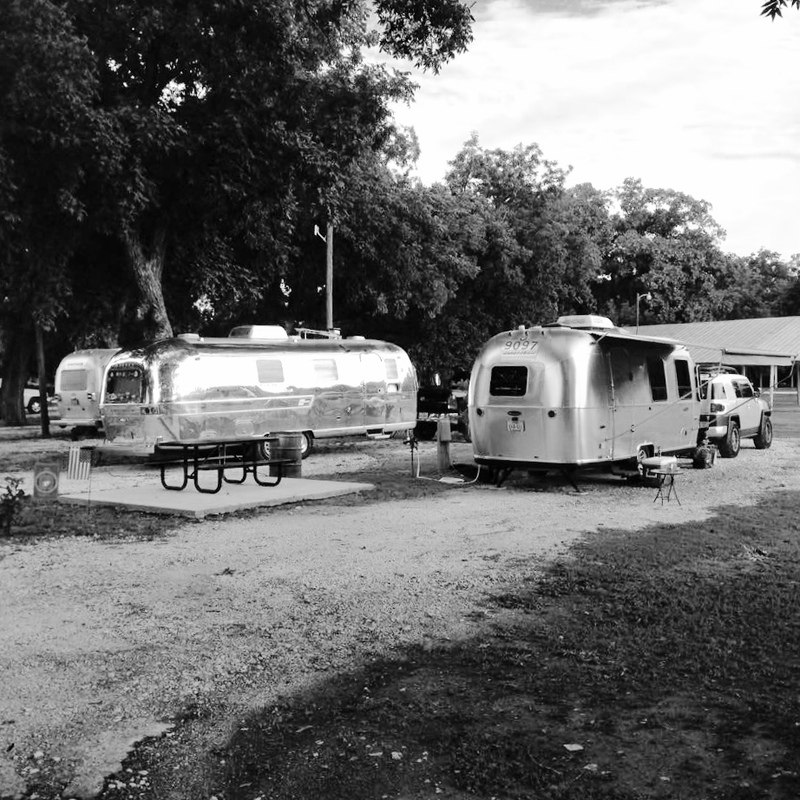 We returned from our first rally with the Heart of Texas Camping Unit, exhausted and exhilarated. The three days we spent with dozens of other Airstreamers were filled with lots of laughs, great food and good advice. We arrived on Friday morning and, as is our custom, immediately took the dogs for a walk around their new environs. We met up with several HOTCU members who had arrived the night before. They were helpful and hospitable. We counted about 10 trailers scattered throughout Hico City Park, where the rally was taking place. Soon after setting up our rig and having a quick lunch, we settled in for an afternoon nap. When we awoke a couple of hours later, the entire campsite was filled with Airstreams! Every site was taken, including the one right next to us. Imagine our surprise at looking out our kitchen window and seeing a gleaming reflection of our own trailer in the polished vintage trailer next to us. Friday evening saw the first cocktail hour and potluck supper…amazing events that seemed to bring out good humor and more food than everyone could eat. We found ourselves in a conversation circle that lasted till 1 a.m.! Needless to say, we were wiped out but well fed. Next morning, we joined the gang again for a big community breakfast, where Cliff’s Bloody Mary’s were a hit. In the afternoon, we walked into the town to pick up a few items at the local market. The town of Hico deserves a whole other blog post. Saturday evening was a repeat of the cocktail/potluck event, but the afternoon sun sapped us of our stamina and we headed back to hit the sack by 10 p.m. Our nighttime dog walk revealed a stunning view of the Milky Way, as there was little light pollution to obscure our view of the heavens. We even saw a couple of meteors streak across the sky. Sunday morning found us back at the community grill, mixing and mingling with our new friends. It seems like everyone has a dog or two (or three or four! ), and all were frolicking about as they searched for wayward nibbles. Folks started packing up and heading out around noon, as the camp’s check-out time is 1 p.m.
All in all, it was a whirlwind weekend, and a memorable beginning to what we hope is a long relationship with a great group of folks. We plan to join the group again the weekend of November 14-16 at Comanche Springs Astronomy Campus, near Crowell, Texas, for a star-gazing party.